Approximatly 3 500 miles through 13 countries and over 2 mountain ranges, 1 of them twice. I aim to raise £3 500 for cancer research. Thats £1 for every mile I plan on covering. Please support me by following the link to my just giving web site. Hello people, I can not believe it but I have finished. I have covered 4932 miles through 14 countries in 84 days of cycling. In this time I have had 3 punchers on the front, had to buy news tyres for the front and back twice, replace the braek pads for the front and back, had 4 spokes snap on the back, replace the rear pannier rack and get some new peddals. Quite a trip really. I am so happy that I have now finished and am now chilling in "FINLAND, FINLAND, FINLAND the place where I want to be"
I set off from Tallinn just after 11am. Not a very eventful day, infact I was a little depressed really. I had had such a good time in Tallinn over the past 3 days with the crowd at the hostel (Big shout going out to Norma, Josh & the Chuck) that I was sad to leave. I found quite a nice camp site at the end of the day which had a sheltered area which was good because it rained. The camp site was also by the sea. But I think as the Boltic Sea as a big lake. How can you acall it a sea if there are fresh water wreeds growing in it? A really nice day. The weather was nice and I was in a good mood. I started by cycling through a national park on some quite forested roads. I had a little stop and chilled next to a cool river for a bit. Throughtout the day I came across some interesting settlements bt the coast with classic Stalinest type buildings from the 1950´s. They are extreamly run down but people are still living in they. I should imagine that they looked very grand when they were new. I was happy to see lots of the building having a bit of work done to them to improve the area. These places were towns that were built near chemical facturies for the soviet industries. Very secrete places because I found out that they were not shown on any maps so they could remain hidden from the rest of the population. Any way I found a great little shop where I bought the most amazing pastry for 50p. Other great thing of the day is that I started so see some hard lithology by the coast (Cliffs in other words). I had not seen coastal cliffs since I was in the south of France. This made me quite happy because there was now a bit of a different character about the coast. Again I found a nice camp site by the sea and went down to the beach fior a bit of the evening. I started out by cycling along another gravel based road. I was heading to a place called Narva-Joesuu on the coast. This provided me with my first views of Russia across the river Narva. I was very temped to swim across just to say that I put my foot into Russia, but the frequency of the guard towers and the thought of AK bullets being fired at me made me descide against it. I followed the Narva upstream for 10km to the Town of Narva which is the border crossing into Russia. This was the furthest I could go and the end to my trip. The 4932 mile mark, I thought that I was going to cry before I got there but I didn´t. I was really happy and cheerful. I sat here for about 30minutes and looked out over Russia thinking I will come back one day to cycle into it. I then had a little look around the town and was not to impressed. I knew that the only train was at 6:30am the next morning. So I went to the train station to find out about it, but it was closed. The bus station is next to the train station. So I just went to ask if you couold take bikes on the bus and they said yes. I asked when the next one was and they said 20 minutes. Fantasic back to Tallinn it was. If it is one thing that I learnt from the Lands end to John O' Graots trip from a couple of years ago, it is not to mill around at the finish point because then the major anti-climax kicks in. A wise move because as soon as I got on the bus it started to tip it down. So it would of been a crap afternoon in Narva. It was also on the bus that I started to realise what I have just finished. 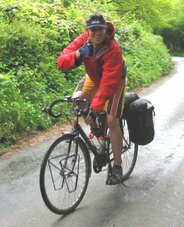 I had cycled across mainland Europe, there were then a few tears. Not many though because I´m hard. I got back to Tallinn and booked into the same hostel, in the same bed infact. But all of the guys I had previously socialised with had already left (Norma you should of stayed one more night so we could of talked about Red Dwarf more). I got chatting to some other guys and went out for a few beers with them. After we were suitably drunk I showed them the spinny round things. Chuck where were you dude, I needed you there. Woke up a bit hung over and a slight twinge in my ankle. Guessing that I stacked it a little harder than I thought off the spinny things the night before. I went to the port to get on a ferry to Helsinki. I ended up on the fast boat which is more costly but it turned out for the best. I arrived in Helsinki at 3pm and I love Finland. When i got off the ferry the first thing I saw was a large strrt map. Great I new the way to the tourist information with in 5 minutes of being in Finland. On the way there, there were two tourist information officers just walking around the street. How cool is that. I love this country. Only problem that I arrived in the middle of a rock festival at the weekend so there was no accomodation anywhere. Even the camp site was full. So with the help from the tourist information office we worked out the best thing to do was get on a bus to Porvoo which is 50km away. They take bikes on the bus as well. COOL. So it was a good job I was on the fast ferry so I could get on the bus to get to Porvoo for 6pm. I then camped here for Sat and Sun. I cycled to the local beach in the afternoon which is 20km away. It was a good ride, I did not have my speedo or GPS. It felt great cycling not constantly working out how much further I have to go if I continue at the present speed. I had no idea of how fast or how far I had left. All I did at the beach was to go for a swim, read my book and fell asleep for most of it. In the evening I had arranged to meet up with the guys I met in Riga at 5am in the morning outside a bar. The Dude from Taunton who now lives in Helsinki and his work mate. It was a Monday night so I was only expecting a couple of pints. I should of known better, this is Finland and these guys work in the bar/nightclub industry. So a few drinks turned into more drinks which then turned into random Finnish shots that I can not pronounce. Some where nice others were an expirience I will try to avoid in the future. Lydon had to leave early but Lumi took me to meet more of her mates which then included more drinking, at which point I ran out of money. Quite expensive, but they kept plying me with yet more shots till I looked like this. I thought of you Speare when I had this photo taken, I was surrounded by beautiful Finnish girls buying me drinks. This does not make you jealous at all does it? I then saw this dude slumped in the corner and thought what a legend I have to get a photo with him. When we left the club there was about 7 of us that got into a taxi, 6 in the back. There was me saying that this would not be legal back in the UK to which I got the answer that it is not in Finland either. They asked me where my hostel was and I said it is on the street that begins with U. So they then asked what it was called and I said that it is the one that begins with E. To which I got the reply that I was useless. To which I said that I´m sorry but I can´t speak Finnish. But being a geographer with great spatial awareness I was able to describe it rather well and I got dropped off and into bed at 4:30am. Rather a relaxed day really, I went round to Lydon´s in the afternoon/evening for a sauna and some traditional Finnish food. Sauna's are cool, quite an expirience really. The thing that made the sauna though was the sausages heated on the hot rocks whilst drinking a cold beer. But I feel that the true iceing on the cake for the evening was playing Goldeneye and Super Mario Kart on his N64 (RETRO). The main thing that I have done today is to update this web site (Probably for the last time). I will meet up with Suvi and Tuomas the couple I met in Slovenia later and then tomorrow head to Turka further along the coast to stay with Tim. The dude I met on my last night in Poland. 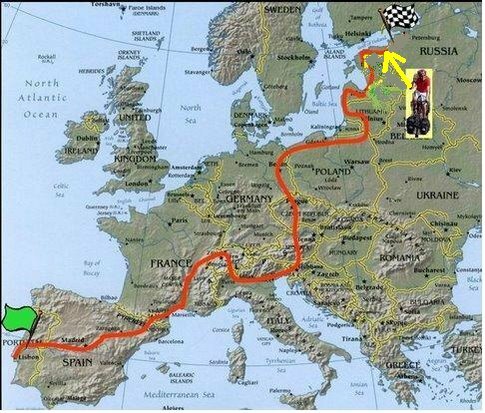 Not a 100 % sure, but something along the lines of when I have finished in Turka, I will cross into Sweden. Then I will catch a train to the artic circle. Then hopefully cycle into Norway in 24hr daylight then get on a ferry back to the uk. 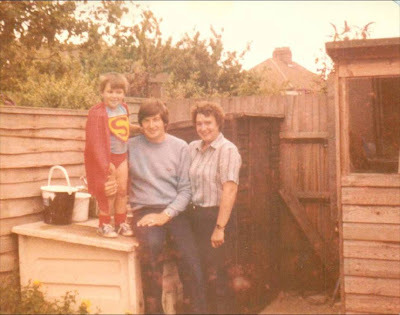 When I was younger I thought that I was Superman. This probably had something to do with the attire my parents chose for me. 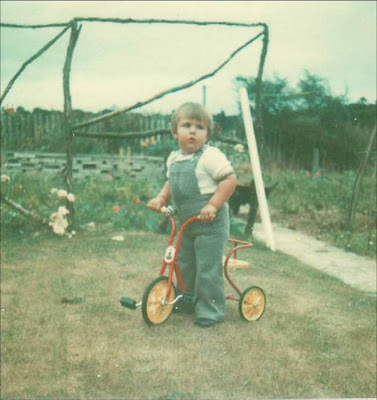 But after several attempts at flying (jumping off the coal bunker in the back garden) my parents decided that a more practical method of transportation may be more advantageous to my well being, thus my first bike. I have had an interesting relationship with bikes in my life, I have several scars which are there to remind me of adventures past. The classic being when I hit the right wing of a car as it was pulling out of a junction. Strangely I thought of my childhood because for the briefest of brief moments I was actually flying, and in style as well. It's a shame that I did not have that suit on that day. But inevitably my flight came to a rather abrupt end as the cold hard tarmac impeded my progress, rather painfully I may add. The crowning evidence that I am not in fact superman.